Ah, Valentines’ Day. The 24-hour span responsible for the greatest number of breakups in the year. A day that drips with soggy Hallmark declarations, bursts with the emotion of panicked last-minute lovers in flower shops, rings with the voices of a million untrustworthy women saying, “No, no, you don’t need to get me anything.” A day of nightmare. Are we all in a nice romantic mood now? For the past four Valentine’s Days I’ve been happily in a relationship, but have steadfastly refused to mark the holiday with anything more than a cursory acknowledgement. Last year my boyfriend and I watched Eternal Sunshine of the Spotless Mind, which is a Valentine’s movie, in a dark, depressing way. It was great. This year we’re going to order in Chinese food and watch a movie. Probably – knowing us – something violent and gory, like Kill Bill. But I’ll admit, the crafter in me does enjoy another chance to decorate, to wear outrageous amounts of red (my favourite colour) and to make cute stuff for people. I do like the excuse to get my boyfriend a token gift of some kind. But that’s the point, people: token. Something small, something caring, something that the other person will like. An old roommate once came home furious at her boyfriend because he’d given her roses on Valentine’s Day. She wasn’t angry because of the flowers in and of themselves, but because he’d clearly given them out of a sense of romantic duty, and she didn’t really even like flowers that much. It was actually pretty funny, in a dark, semi-depressing way. (Are you seeing a Valentine’s Day theme emerging here?) Meanwhile, my boyfriend gave me a book of Neil Gaiman’s short stories, with a sweet little message written inside. My roommate’s boyfriend – in her estimation – did not compare favourably. So if you’re going to give Valentine’s gifts, ignore the dull clichéd ideas of flowers and chocolates and teddy bears (unless they’re awesome pirate teddy bears – see below) and just go with something your significant (and hopefully to remain that way past midnight) other will really appreciate. A book, a CD, a gift card to the coffee shop they stop at every morning, a special home-cooked dinner, a 6 pack of imported beers or a bottle of good wine. Or something that you’ve made. Whether or not you’re very good or practiced at making things, it means a lot to people to receive something you put time and effort into. 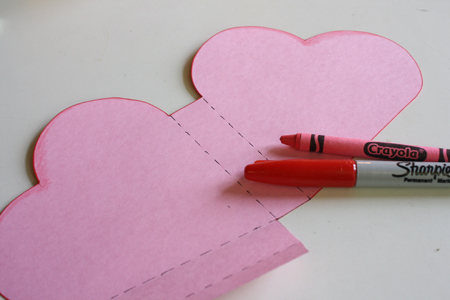 1) Print the heart box template onto your coloured cardstock, and cut along the solid black lines. To design your own template, you just need a heart whose sides are completely straight lines for about the bottom 2/3 of its height. Trace said heart, leave a rectangular gap, and trace the heart again, straight sides parallel to each other. 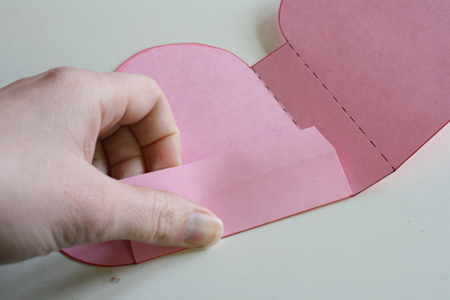 Then add another rectangular gap of the same width on the outer side of one of the hearts, and draw another narrow rectangle next to that for the tab that glues the two hearts together. Just look at the template image – it’ll make way more sense than the jibberish I just wrote. 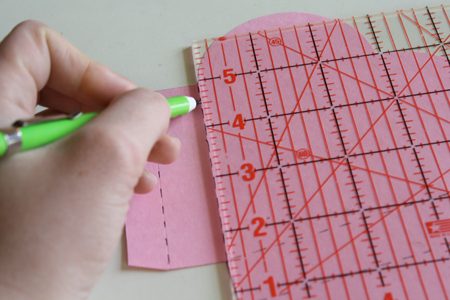 3) Using your ruler and mechanical pencil, score the dotted lines on the template. This means dragging the metal tip of the pencil, with no lead showing, along the dotted lines to create an indented line. This helps the paper fold neatly. 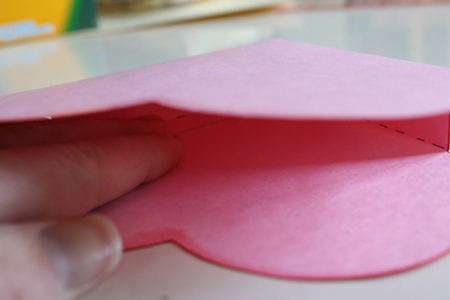 4) Fold (inward) along the dotted lines. 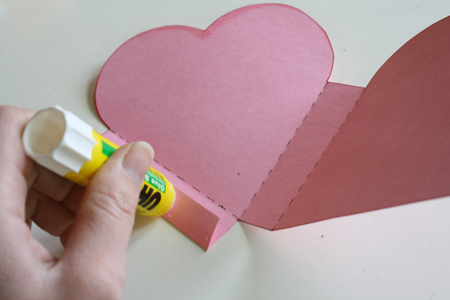 5) Apply glue to the narrow tab on the left side of the template, then secure it to the inside of the opposite heart shape. Or you can tape it in place. 6) Decorate as you see fit. Write a note on the front or back, glue a gaudy sequence of feathers and flowers and sequins all over the box, colour it black and cover it with Dashboard Confessional lyrics in invisible ink while crying softly to yourself – whatever floats your boat. 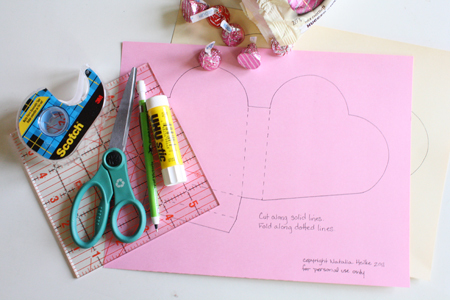 Ooooh I saw another heart-shaped box earlier today and this one looks much simpler, which means it’ll come out a lot cleaner! Thanks! I thought of popcorn when I saw the final picture. 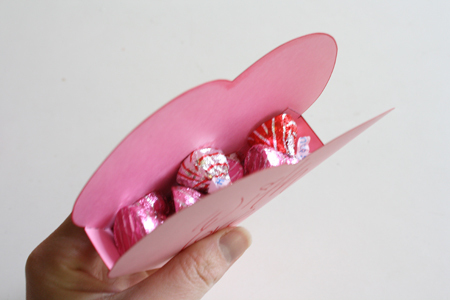 I can see cinemas stealing the heart box idea and using it for valentine’s day. 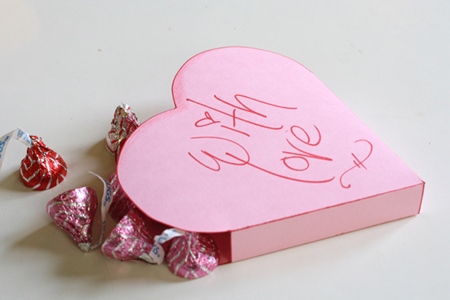 hmm, aren’t you afraid that Jerermy will see the box on the blog, so he’ll know what you’ll give him in advance? 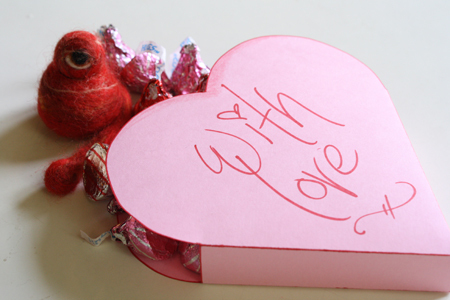 wouldn’t you like to wring all the adulation of the heart box out of him as is possible? this is neat, though! 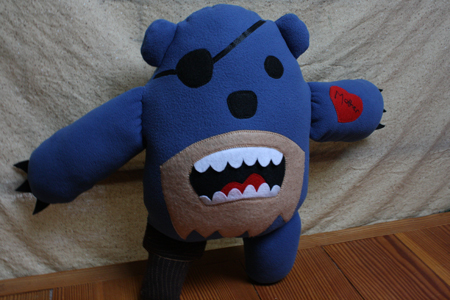 and was that gorgeous pirate teddy hand crafted? :D I try, Marita, I try. Maybe you should send them over here for a few key tips. N, I totally had this problem at Christmas, when I couldn’t post tutorials for all the gifts I was making, since many of my friends and family actually read my blog. On the other hand, now I can post them for next Christmas, while I make new stuff, and post that the next year, and so and so forth. It wasn’t a problem with this post, though, as I had other plans for Jeremy. I do love the popcorn idea, btw. Hey! I saw this tutorial and it looks so cute. My cousin has given birth to a baby boy so i bought a book for him which is big and rectangle so if i want to make a box in which i can easily slip that book. 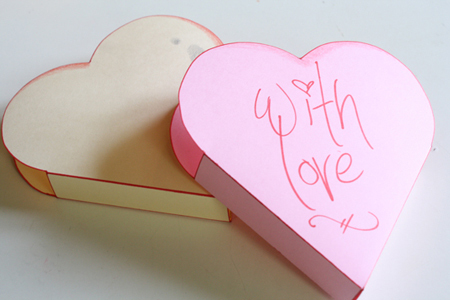 should rectangles be straight or a little turned like you did with the hearts one. Please reply fast as I have to visit my cousin after two days. 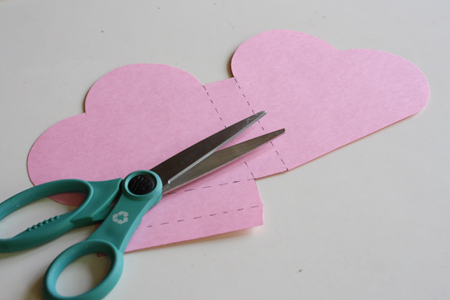 Well I think she turned the hearts because they had curved sides, but in rectangle all sides r straight so i don´t suppose you must turn it you kan keep it straight. Well this is my opinion, otherwise you can ask the others. Love the book box idea – so cute! IF I’m understanding your question correctly, the answer is that you should be fine leaving the rectangular tabs straight if you’re making a totally rectangular box, like for a book. Good luck with the project, and enjoy meeting the new member of your family! system, as well as the ability to buy tickets immediately and more. Walmart, weather, wells fargo, wikipedia, white pages,.
. I para escribir un pequeño comentario para apoyarle.
. ¿Alguna vez te encuentras con cualquier navegador web cuestiones ? Safari . ¿Tiene alguna recomendaciones para ayudar a solucionar este problema problema ? para iniciar mi propio blog en un futuro próximo pero estoy teniendo un duro hora de tomar una decisión decidir entre BlogEngine / WordPress/B2evolution y Drupal . PS Mis disculpas para es fuera de tema , pero tuve que pedir ! s contenido cotidiana junto con una taza de taza de café. Realmente .. Excelente colores y tema . mi propio personal sitio web y saber dónde sacaste esto desde o lo que el . para seguir adelante y darle un agradecimiento desde Lubbock Tx ! debido a debido a este problema. Hola Este artículo podría no mejor mucho mejor ! Mirando article Me recuerda a mi compañero de cuarto anterior! una muy buena ver . Gracias por usted ! Heya estoy soy por primera vez aquí . realmente útil y que me ayudó mucho mucho . Good response in return of this difficulty with genuine arguments and telling everything on the topic of that. subject however I simply wanted to ask. Many thanks! wind chimes happen to be used for a number of reasons. It utilised to be true that virtually all kitchens were standard shape and form. claimed migtht increase blod circulation to the prefontal cortex. is that I’ve wasted about 4 hours during tthe past week playing this. too communiate with each other plus hold aall oof us together as being a society. the particular puzzle, discover the keys and score a lot more as possible. Take notice though, as the game speeds up as you go. If you want Codde Lyoko games you can find others on mygames4girls. collect the particular hidden recommendations. ” Husøy explained. When I search for games to put in the class room, I uuse the same approach every other media. male chaacter and lots of naked women. Alternating between hot and cold packs is one of the best, natural ways to get quick back pain relief. prescription. These exercises should give you a good introduction to massage the face of art. as I website possessor I believe the written content here is really superb , appreciate it for your efforts. Valuable info. Lucky me I found your site accidentally, and I’m stunned why this twist of fate didn’t took place earlier! have great customer care, yet have yet to receive a reaction to a couple of queries I made through their website. I use crayons and markers to colour bits of the box … Great great post ..! Há de você transformá-la em sua sorte ou não. Aqui na sessão “Explore sua Cidade” do blog da Timberland mostramos como você não precisa sair da cidade para curtir uma aventura! Estamos numa época em que os moradores das grandes cidades estão redescobrindo os muitos lugares e atividades interessantes que acontecem ao ar livre no ambiente urbano, e muitos estão se apropriando do espaço público para realizar atividades culturais, esportivas e de lazer, e isso é ótimo! Hallo Es wurde gerade wachsam Blogg über Google und fand, das es wirklich informativ. Ich wirs aufpassen Brüssel. Ich werde dankbar, wenn Siee weiterhin diese künftig. Grosser Menscnen werden von Ihrem Schreiben profitikert werden. Cheers! Jeder lliebt wenn Leute zusammen und Aktien Aufrufe.